Are you on the market for the best coffee scale? Rest assured that you’ve come to the right place. The art of perfecting your coffee begins in your own kitchen, and it wouldn’t get you anywhere without a scale. When I started home-brewing a few decades ago, spoons were the only means of measure I’d allow in my kitchen. A scale hadn’t felt like a need. But over the years, things changed and different varieties of coffee required different quantities of grounds that eventually lead me to buy a scale of my own. I’ve owned half a dozen, and tested multiple dozens of scales at various occasions. So I made it a point to craft a review with the hope that my experience would help you locate your ideal scale. Grams, ounces, pounds, and millilitres. Grams, ounces, pounds and millilitres. Let's delve into the reviews of burr coffee grinders one by one. If you’re a coffee snob who wouldn’t dream of missing a freshly ground cup of joe even when you hit the road, then CoastLine Digital Pro is a scale you’d love. Clocking in at 4 x 5 x ¾ inches, it’s as compact as the name suggests – perhaps a little larger than a smartphone. It’s also light in weight, and comes with a platform not much bigger than the scale itself – making it just the right size to travel in your pocket. The biggest selling point, however, is its accuracy. It can read up to 1/10th of a gram, and that is a quite remarkable scale for a pocket kitchen scale. You can also choose between ounces and grams at the touch of a button for easy-reading. The body is made entirely up of good quality stainless steel. Not only is it easy to clean, but also pleasant to look at. What’s more, it’s robust and may last for quite a long time. The clear-cut display is large and wide with a blue LCD screen. It’s easy to read even in low lighting and without glasses. You’d love how functional it is as well, though they don’t feel to be of the highest quality. After all, you ain’t paying much to make it all yours – so you can’t be asking for the moon. Nothing tastes better than home-made coffee from freshly ground beans - and CoastLine Digital Pro is a wonderful scale to get started. The price is just right for an entry level unit, and so is the quality. I hold nothing back in recommending it to you ‘cause you wouldn’t regret your buy if you invest it here. Ozeri Touch Professional Digital Kitchen Scale indeed looks very professional. You can fool anyone into thinking that what’s lying in your kitchen is one of the high-end gadgets found on the market. The most prominent feature found is the touch panel coupled with a glass surface. It’s as sleek as that of a smartphone, but the tempered glass is said to be 4 times thicker than normal glass – making it sustain up to 12 pounds of weight you place on top. The accuracy of measure is another thing worth noting. This is made even better with a Tare function you’d love. Its measurements range from 0.05th of a pound to 12 pounds. This weight can be displayed not only in pounds, but also grams, kilograms and ounces. The batteries, however, are not the longest to last. They may die within a few months depending on the frequency of use. It’s not surprising given that the touch panel consumes a lot of power. The good news is that they are easily replaceable and inexpensive. The auto shut-off may seem a bit too short as well. It might irk some of you, but see the bright side of it and consider it as another way to save battery life. What’s more, you’ll speed up weighing ingredients as well - just so you could avoid having to restart the scale! Not many scales are as functional and as inexpensive as the Ozeri Touch Professional Digital Kitchen Scale. It in fact has the aesthetics of a high-end scale, and the functionality of an entry-level scale – from an affordable price point. All in all, I wouldn’t hesitate recommending it you if this are what you’ve been looking for in a kitchen scale. If you’re a buyer running low on your budget, but want a reasonably accurate little scale that gets the job done even in a compact kitchen, then the Etekcity Digital Kitchen Scale is your best bet. Clocking in at about 5.5" square feet, it’s one of those scales that’d hardly take up any counter space. You can simply tuck it away in any corner of your kitchen, and it’ll not have you worry until next time. I also found myself drawn to the build-quality and aesthetics of Etekcity. It has a beautiful stainless steel finish that can be wiped clean after each use, and a wide, clear LCD display lit well enough to read even under low light settings. Etekcity is quite functional for a low-end scale as you can choose between grams, ounces and pounds to display weight. However, it can weigh up to a maximum of 11 pounds, and is not the best when it comes to low-end accuracy. It actually starts feeling the first gram when you’re weighing about 3 grams. So if the accuracy is of utmost important for your recipes, then perhaps you should splurge a little more on a scientific scale. 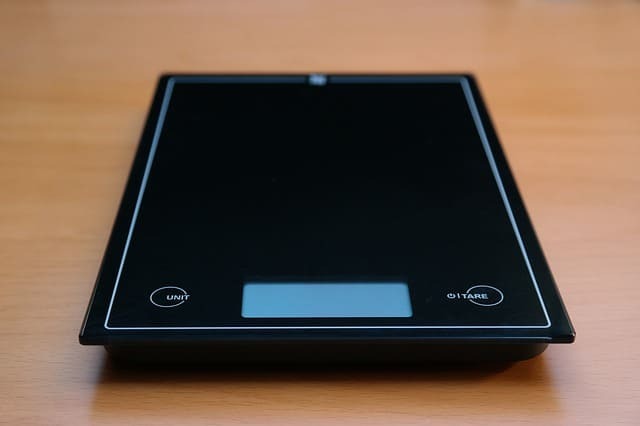 All things considered, for a buyer on the market for a low-end kitchen scale, I hadn’t come across a better unit than the Etekcity Digital Kitchen Scale. It has a reasonable battery life, uses 2 cheap AAA batteries and built good enough to last way past your money’s worth. Hario Coffee Drip Scale/Timer is definitely an expensive unit that might put most buyers off. Since you’re one of the few who decided to get a better look at it, count yourself lucky – it’s definitely worth checking out. The biggest selling point of this scale is its accuracy. It can detect weights that are as light as 1/10th of a gram and as heavy as 2000 grams. This wide range allows many items to be weighed at a confined space – adding a huge bonus even to professional kitchens. Though it reads only in grams, its precise reading tops everything off. What’s more, it comes with a built-in timer. For most of you, this may not sound as big a deal, but rest assured that it helps you brew the perfect cup of joe. It also features an auto shut-off system that kicks in after 5 minutes of inactivity. This, however, doesn’t apply when the timer is in use. When it comes to the build quality, I think it can live way past your expectations. The stainless steel body will ensure that, and make cleaning much easier. Featuring touch-sensitive buttons and a good LCD screen, you wouldn’t have any trouble operating it either. If you don’t mind spending a pretty penny to get the best accuracy in your measurements, then look nowhere else; Hario Coffee Drip Scale/Timer is the one. It also comes with a few bells and whistles such a prolonged shut-off time and built-in timer – certainly living up to your money’s worth. Among the many things that make Elec3 buyable is its Tare function. Not many scales have the accuracy this function offers. It in fact allows you to weigh one thing first and the next without default – enabling you to find the net weight of an item from its container. The scale is also quite handy as it does give satisfactory readings starting from 1 gram up to 5 kgs. You can weigh it in multiple measurements from grams to ounces to pounds and millilitres. Though it isn’t as accurate as high-end scales, it’s a steal for the price. The looks are definitely a bonus for the price. The brushed stainless steel finish will not only please your eye, but also help you keep it clean – especially since it’s not waterproof you can have it wiped clean. It also features an auto shut-off system. If you’re as absent minded as I am, then you’d like this feature that really saves a lot of battery power. It takes about 45 seconds to activate this system, which is long enough for you to switch between ingredients. The LCD screen is extremely user-friendly for such a compact little scale. It has a backlight lighting the screen up and making it much easier to read. The size is also very convenient when it comes to storage. Additionally, it comes with a low-battery indicator that’d help you know when it’s time for a new pair of batteries. Not fit to measure in milligrams. Charged with reusable AAA batteries, Elec3 Digital﻿﻿ scale offers you good functionality, coupled with an ergonomic design and durability. Though not the best in terms of accuracy, it’s a good scale to get the job done at a low cost. Inspired Basics Digital Kitchen Scale is a lot similar to Elec3. The main difference lies in their capacities, and this scale can weigh up to 15 pounds, starting from 1 gram. It cannot, however, measure milligrams. But the scale compensates for it by providing consistent readings every time. The tare function is something you’ll surely love. It helps you calculate the net weight of your ingredients by deducting the weight of the container. All you need is to place the container and press ‘Tare’ – the scale will bounce back to zero. The build quality, on the other hand, is quite pleasing. It’s made up of high density durable ABS and has touch control buttons. Though not waterproof, cleaning is a matter of seconds. All you need is to wipe it clean and it’ll start to look brand new. The size, which measures up to 6.32 x 9 x 0.68 inches is just the perfect size for a scale. It’s wide enough to hold a plate, yet compact enough to stove it away without a care in the world. I really think Inspired Basics Digital Kitchen Scale has got the perfect size for a scale. On the downside, however, you might find the LCD display to be positioned awkwardly. This makes the numbers not clear from all angles, so you’ll have to look directly over the top of the screen to read it. This isn’t a deal-breaker, but still an inconvenience worth noting. Overall, Inspired Basics Digital Kitchen Scale is a decent scale that wouldn’t end up disappointing you in any way. It feels sturdy, looks good, measures well, lasts long – and the list goes on, leaves you nothing much to ask for. Among the many things to love about the Ozeri Pronto Kitchen scale is its enlarged weighing platform. This platform was made to accommodate containers that usually had trouble fitting on compact, space-saving scales. So if you’ve had enough of such scales, then Ozeri Pronto would be a game changer for you. Then comes its accuracy, which is quite remarkable for the price. Though it lacks the capacity to measure milligrams, it does give out consistent readings so that you can always rely on it. Another thing you’d love is its patience. Unlike most scales, Ozeri Pronto can wait up to 2 minutes before shutting down – giving you ample time to switch between ingredients. This, surprisingly, doesn’t seem to have any impact on the battery life. Though Ozeri Pronto uses regular AAA batteries, it’s designed to consume less power. So it can last for a couple of months of daily use before needing a replacement. The Tare function is another feature you’d like. It’ll allow you to get the reading of the ingredients minus the weight of the container. It can also read 5 units of measurements, and easily convert between them whenever you need. On the downside, however, Ozeri Pronto has a relatively small LCD display. When using plates or containers that’s quite bigger than the provided platform, then the container obstructs the view of the screen. Ozeri Pronto Kitchen Scale is one of the highly rated scales on Amazon due to its reliability. It provides consistent measurements and is extremely user-friendly. In fact, it’s one of those units that give the best bang for your buck. As a coffee lover, a coffee scale is one of the few things that should be readily available in your kitchen. Luckily for you, they aren’t as expensive as the other items needed to make a delicious cup. That, however, doesn’t mean you shouldn’t invest enough time to make the right buy. Though you wouldn’t lose a lot of money if you happen to buy the wrong scale, the waste of time and coffee would be just too much to count. So scroll down and figure out what you should actually be looking for in a kitchen scale. First things first, no scale is worth buying if it isn’t accurate – at least to a satisfactory level so that you wouldn’t end up ruining your recipes. Most scales don’t measure in milligrams. They round it up to the nearest whole number. Say the actual weight is 5.8 grams, the scale would display it as 6. This wouldn’t make a big difference for everyday tasks, but if it does make a difference then splurge a little more on a high-end scale. Batteries are usually the power source of digital scales. While it makes the scale portable, batteries tend to meet an early death. So make sure your scale is powered by batteries that are readily available at a lower cost. AAA batteries are the most common ones used, and they’re quite cheap. I would hesitate recommending you a scale without the tare function, unless of course you don’t mind following the old school technique of writing down and finding the net weight with a pen and paper. Tare function, in simple terms, help you measure the weight of the container and then the ingredient to ultimately find the net weight and ensure precision. If precision is something you highly value, then this function is a must to look for! So is the same with a coffee scale. First, make a list of the things you’ll be weighing using the scale and get a rough idea about the space needed to hold them all. Most scales on the market are catered in a space-saving design, so they don’t occupy a lot of space. While this may sound cool, it’ll face difficulties in housing larger containers. So take it into consideration before making a buy. Almost all scales in my list have an LCD screen with touch controls. They’re the latest hit in the market because they make cleaning a child’s play. No grains or coffee grounds would make their way through the buttons and as a result you’ll only want to wipe it clean. They also add a sleek look to the overall scale, blending in well with a modern kitchen. If you’re like me, then you’d be in a love-hate relationship with this function! You’d love it because it saves battery life. After all, it’s only reasonable to forget to manually turn the scale off in your excitement to ready your cup of joe. In the same way, you’d hate it because some scales are very impatient. They go off in less than a minute and if you’re preparing pour-over coffee, there’s no saying as to how annoying it could be. So I’d say to look for a scale with this feature, but with at least a minute of patience. This way, you’d not hate it so much. For those who hate the auto-off function, a scale with a built-in timer would offer a wonderful solution. This feature enables you to time your scale to stay up until you’re done with your brewing process – and shut down once the timer is off. A long article comes to an end, and I hope you’ve figured out what you were after. Blend my buying guide with the scales included in the list - and that would eventually lead you towards your ideal buy.